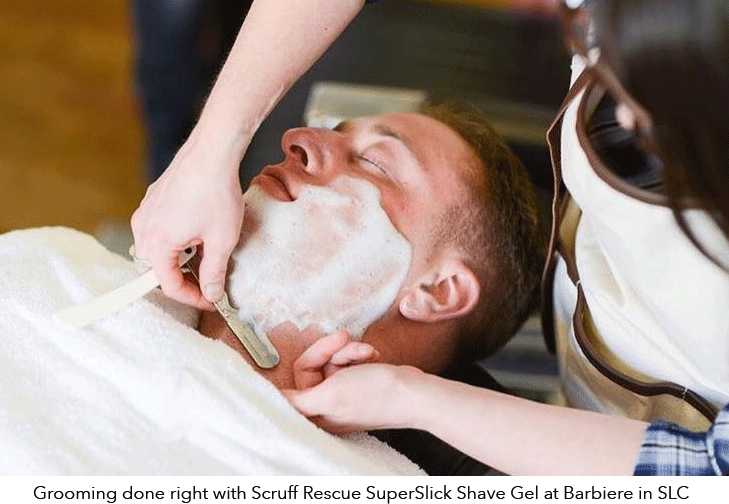 Shaving is the first step in the Scruff Rescue system engineered to help men look their best. SuperSlick Shave Gel provides a protective hydrating cushion between your face and razor, giving you a perfect close shave without irritation, nicks or razor burn. At the same time, we worked hard to ensure our shave gel has a face friendly pH that won't leave your face dry or tight like traditional alkaline (high pH) shave products are prone to do. The Scruff Rescue products scent is woodsy-citrus from pure essential oils while energizing yerba mate, antioxidant rich green tea and conditioning olive leaf keep your face hydrated, soothed and calm, so you can carry on. And if you want to go there, this amazing product is also perfect for an irritation-free head or body shave. If your whiskers need a mild and conditioning shampoo, then SuperSlick Shave Gel is great for that too. Wet face with warm water to prepare beard or use in a warm shower. Use a dime-sized amount in your hand, rub palms together to work up a lather, then apply evenly. For the closest shave always use a sharp razor and rinse it regularly! Rinse thoroughly then use Face Scrub as your next step in the Scruff Rescue anti-aging face care regimen. Herbal Infusion (Purified Water (aqua), Camellia Sinensis* (green tea) Leaf, Equisetum Arvense* (horsetail) Leaf, Illex Paraguarensis* (yerba mate) Leaf, Olea Europaea* (olive) Leaf, Urtica Dioica* (nettle) Leaf), Sodium C14-16 Olefin Sulfonate, Coco Betaine, Cocamidopropyl Hydroxysultaine, Glycerin (vegetable), Sucrose Cocoate, Coco Glucoside and Glyceryl Oleate, Cetearyl Alcohol, Glyceryl Stearate, Anisic Acid, Benzoic Acid, Cyamopsis Tetragonoloba* (guar) Gum, Xanthan Gum, Dehydroxanthan Gum, Hydroxypropyl Methylcellulose, Citrus Bergamia (bergamot) Essential Oil, Lavandula Angustifolia* (lavender) Essential Oil, Cupressus Semprevirens (cypress) Essential Oil, Styrax Tonkinensis (benzoin) Resin, Citrus Paradisi (grapefruit) Essential Oil.